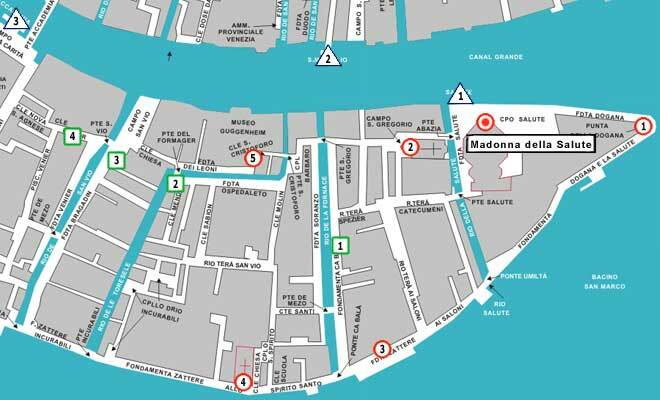 Venice Hotels Guide See Madonna della Salute on the interactive Map of veniceXplorer. The failure of every medicine and prophylactic then known drove the government and people to look to religion to save them. A procession was organised in which almost all 10,000 survivors participated. They walked incessantly around Piazza San Marco for three days and nights, with torches and votive statues. Finally a pronouncement was made that, if the city escaped total devastation, they would build a temple of a size and beauty never seen before. The heavens then seemed to come to the aid of the Republic. In the following week the progress of the epidemic slowed, and within two weeks it diminished altogether. Baldassare Longhena, a 26 years old young architect, whose style was known as the new Baroque (Venice has always been conservative), was chosen, by competition, to head the project. 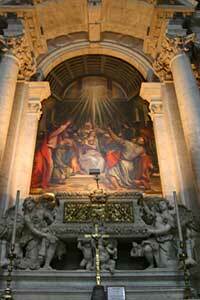 He started build the church in October 1630. The foundation needed to be reinforced with more than 300,000 posts in order to support the weight of the enormous marble structure. The edifice became an exemplary model of Baroque, studied and imitated all over Europe. The church was consecrated on 21st November 1687. It is constructed of Istrian stone and marmorino (brick covered with marble dust). While its external decoration and location capture the eye, the internal design itself is quite remarkable. 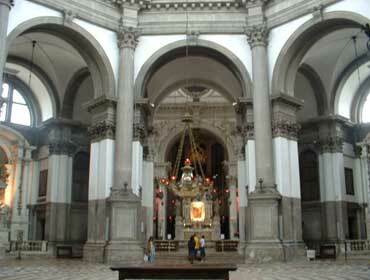 The octagonal church, while ringed by a classic vocabulary, hearkens to Byzantine designs such as the Basilica of San Vitale. The interior has its architectural elements demarcated by the coloration of the material, and the central nave with its ring of saints atop a balustrade is a novel design. It is full of Marian symbolism - the great dome represents her crown, the cavernous interior her womb, the eight sides the eight points on her symbolic star. The altarpiece of the Baroque high altar, designed by Longhena himself, is a Byzantine Madonna and Child of the 12th or 13th century. Tintoretto contributed Marriage at Cana in the great sacristy, which includes a self-portrait. The most represented artist is Titian, who painted St Mark enthroned with SS Cosmas, Damian, Sebastian and Roch, the altarpiece of the great sacristy, as well as ceiling paintings of David and Goliath, Abraham and Isaac and Cain and Abel, and eight tondi of the Doctors of the Church and the Evangelists, all in the great sacristy, and Pentecost in the nave. Every year, on 21 November, the Feast of the Presentation of the Virgin, almost all the Venetians visit the Church to the Salute for a service of thanksgiving for deliverance from the plague. 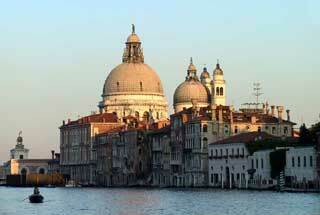 This involved crossing the Grand Canal on a specially constructed pontoon bridge. 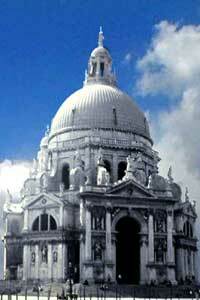 The Festa della Madonna della Salute is still a major event in Venice.